This is Messi's most important era at Barcelona. That he is not a learner and an outstanding student anymore, but a guide, a teacher and a godfather is the reason why. Lionel Messi has proved time and again that he is Barcelona’s jugular vein. 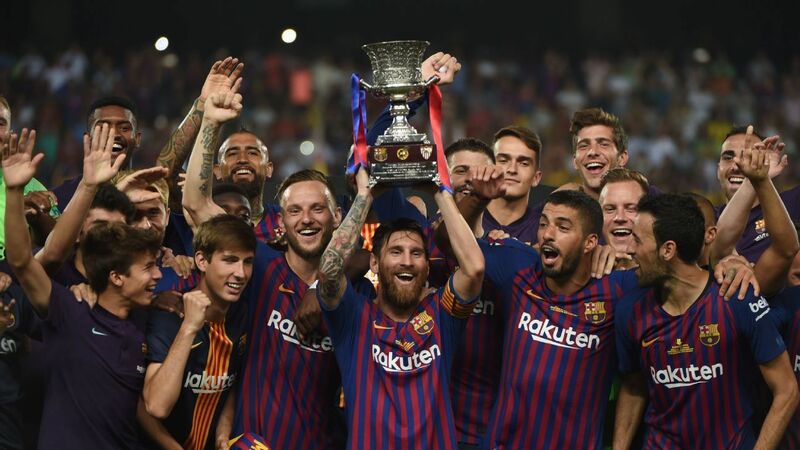 Sunday’s Spanish Super Cup win was just another instance of how colossal his being is for Barcelona, and with another trophy added to his already brimming bag of accolades, the little Argentine became Barcelona’s most decorated footballer with 33 trophies. Andres Iniesta, who moved to Japan at the end of last season, sits second with a grand total of 32. Barca’s 2-1 win over Sevilla in an out-of-ordinary single-final fixture in Morocco was reminiscent of dozens of similar moments in the past. If déjà vus were actually a thing, Messi would be the prime example as he repeats his genius over and over again. So much so that it was Messi’s free-kick that assisted Barca’s equaliser and injected the much needed killer-instinct. But there is so much that he can do. From a kid signed on a piece of napkin to becoming the world’s greatest, Messi’s journey has been all but a smooth passage. Too much has been thrown his way, both on and off the pitch. Too much for someone who has always wanted to play football and just that. Most elite footballers blossom in their early-20s, but Lionel Messi has always been a different breed. In his early 20s, he was already being compared to Diego Maradona, Pele and Johan Cruyff. He continues to be tossed around for ‘failing’ to replicate international success of Pele and Maradona. That if he fails to do such, he will never surpass the two legends. Does it bother him? Not one bit. Because maybe even he knows he is in a league of his own, where others are just passers-by. Things have not been simple outside the pitch too. Messi has had to deal with tax issues, fake-scandals and unnecessary controversies that were meant to distract him from his most beloved. But little Leo has always adored football too much to let a few meaningless comparisons and controversies bother him. Personality-wise, Messi is an introvert. He does not like to talk much. But like all good artists, he has his own ways of talking and when he starts to do so, with a football at his feat, he is the most fluent; like poetry in motion. Andres Iniesta’s departure to Japan brought the curtains down on Barcelona’s golden-midfield days. Legends like Carles Puyol, Xavi Hernandez and now Iniesta have all disappeared into dusk, and this only means dawn of a new era is shining above the Camp Nou. The new-look Barcelona does not have a Barca-DNA, as many may say, and is genetically engineered. Because the club’s infamous youth academy, La Masia, is failing to reproduce the league of legends that ruled the football world for half-a-decade under Pep Guardiola’s guardianship, adoption is now the only and emergency option. Therefore, to martial the new recruits, Messi’s seniority is now more vital than ever. The Argentine will have to be a source of inspiration for those around him, like always. With Iniesta and Xavi around, responsibilities were shared. Without them, Messi would not have that leverage. Although Gerard Pique and Sergio Busquets are nothing less than war-veterans, when it comes to inspiration, Messi beats everyone. The little magician is at the summit of his career, and at the same time, entering the twilight. At club level, there’s nothing much that he would want to earn at his point anymore. He has the highest share of riches, has been there and done it all and now has duties to fulfill. New entrants like Philippe Coutinho, Ousmanne Dembele, Arturo Vidal, Arthur and club youth like Denis Suarez have tremendous potential. But stakes at Barcelona are high, and margins of error equally low. In such circumstances, Messi’s role, as an experienced individual and as someone who is the face of Barcelona and football, becomes ever so significant. He does not only have to lead the team, as the captain, by example, he also has to show them how it is done too. Maybe a pep-talk here and there could do well, we don’t know. The most important thing, however, will be his ability to pull the strings and initiate a vigorous chemical reaction. This is Messi’s most important era at Barcelona. That he is not a learner, an outstanding student anymore, but a guide, a teacher and a godfather is the reason why.